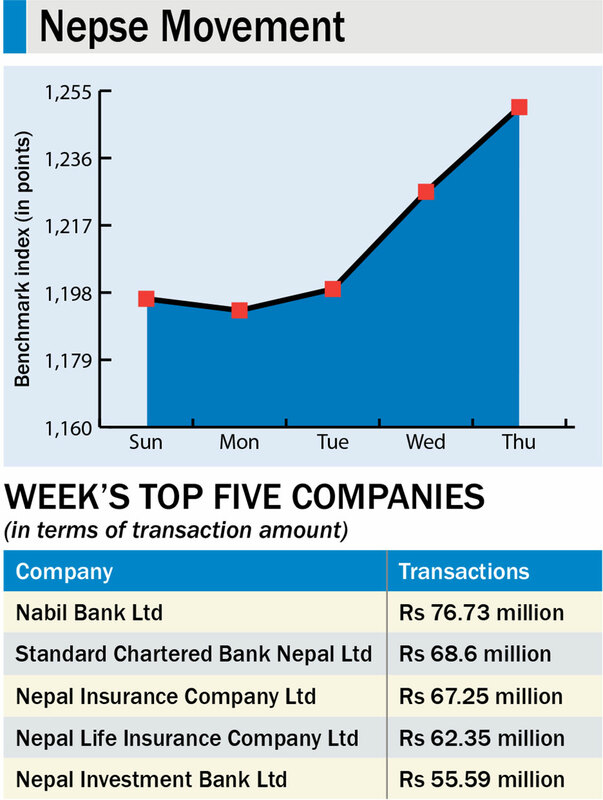 KATHMANDU, April 7: The Nepal Stock Exchange (Nepse) benchmark index jumped 54.15 points this week to close at 1,250.39 points on Thursday -- the last trading day of the week. The stock market has been on a recovery path since last week following a huge downfall on the account of rising interest rates and oversupply of shares in the market with Finance Minister Yuba Raj Khatiwada's statements contributing to the free-fall. Though there has not been any improvement in the liquidity position of banking industry, stocks have rebounded in the last two weeks. 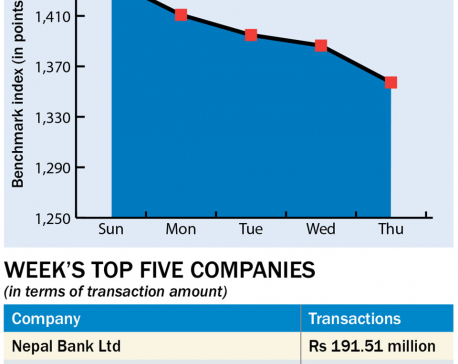 A stock broker, however, told Republica that the recent increase in deposit volume in banks have boosted confidence of investors. "Stocks were on a downward trend mainly due to the rising interest rates amid shortage of lendable fund in the banking system. Investors are hopeful with the recent data of some growth in deposits," said the broker. "There were news reports that the central bank was introducing a new rule to allow banks to bring funds from foreign banks to ease the current credit crunch problem. Investors are hoping that this new arrangement would address the current liquidity problem and there will be correction on interest rates," the broker added. All trading groups ended in the green zone this week. 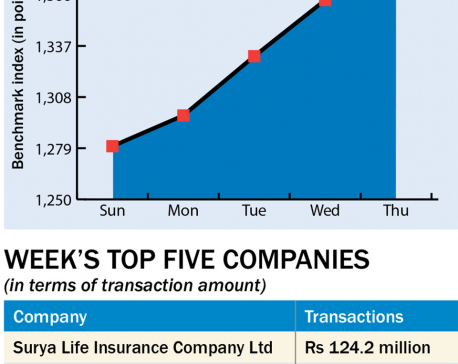 Insurance was the highest gainer of the week as its sub-index rose 348.99 points to close at 5,804.57 points. Manufacturing and processing group followed the suit as its sub-index climbed 103.55 points to end at 2,251.54 points. Microfinance group also ended 95.39 points higher at 1,409.38 points. Sub-indices of Hydropower and Development Bank went up 79.2 points and 78.38 points, respectively, closing at 1,497.78 points and 1,500.78 points. Hotels group registered a gain of 56.93 points and finished at 1,815.91 points. Banking, the heavyweight group, also went up 39.73 points to close at 1,119.55 points. 'Others' group logged a gain of 23.94 points to settle at 695.81 points. Finance and 'Trading' groups also went up 14.4 points and 2.7 points, respectively, closing at 650.72 points and 201.76 points. Nabil Bank Ltd topped the list of companies in terms of turnover (Rs 76.73 million) while Janata Bank Ltd remained at the top in terms of number of traded shares (150,000 units). Radhi Bidhyut Company Ltd became the top company in terms of highest transactions (2,115). 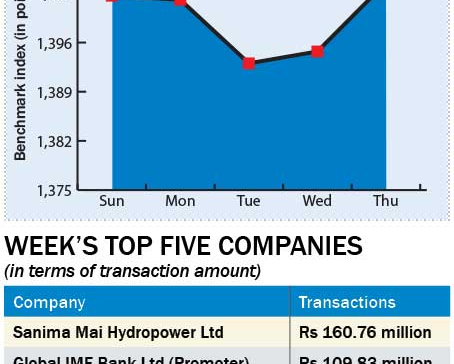 A total of 5.45 million units of shares of 181 companies worth Rs 1.69 billion were traded in the market this week through 27,633 transactions. Bonus shares of Sahayogi Bikas Bank Ltd, Jyoti Bikas Bank Ltd, Citizens Bank International Ltd, Swabalamban Laghubitta Bittiya Sanstha Ltd and Nepal Bangladesh Bank Ltd were listed in the market this week for trading.